The Story Behind The Photo: Back in 2014 I decided that I was going to spend a few days in Melbourne over the Christmas break – basically because I could. I flew from Brisbane on Christmas Day, arriving around middayish. Checked into the hotel and decided to head out for a walk to see what was going on. I knew that I wanted to see some of the local street art in Melbourne and headed to firstly Union Lane, which is just off the Bourke Street Mall and then to Hosier Lane – probably the most famous street art location in Melbourne. Hosier Lane is located right opposite Federation Square and not far from Flinders Street Station. I was surprised to see so many people out but I guess us tourists have little else to do in a foreign city on Christmas Day. I had taken a photo of this particular artwork in a ‘regular photo’ sense but decided to try something a little different and took a photo of my phone taking a photo – very technical of course 🙂 I saw the girl posing and thought it would make a great addition to the photo so I quickly snapped the shot. I did a bit of editing with this photo, in that I cropped it slightly and enhanced the colour – I tried to do something with my thumb but I couldn’t quite work out what to do with it to be honest. What I love about this photo: I love the colours. I love how bright and clear the artwork is. This Jack Douglas piece was amazing in person and I tried to bring out the vibrancy of the art when editing. I love that the art is really the hero of this photo. Even though there is quite a lot going on, the eye is still drawn to the amazing artwork. What I hate about this photo: My thumb – I wish I had a nicer thumb… there I said it. I even tried to edit it but not very successfully. Final Thoughts: I really do love this photo (despite ‘Thumbgate’) and that trip to Melbourne was really want cemented my love for street art. I liked it a lot before but being able to wander the streets of Melbourne and actually see people creating art was definitely something that I won’t forget about that trip. Hosier Lane is ever-changing too, every time I go to Melbourne I try to get to this area. There is some work that is constant but a lot of it changes all the time. It is also a great place to watch artists at work. And of course, it is a great place for street art photography. 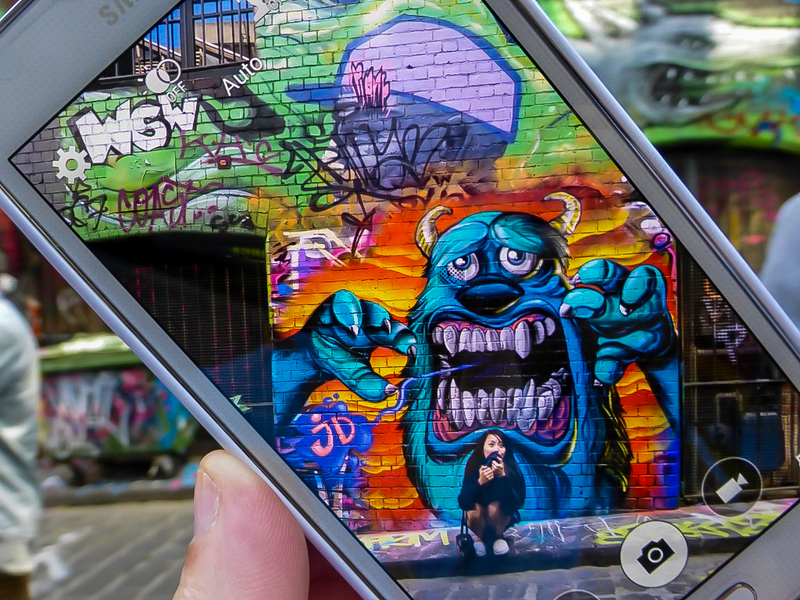 Melbourne is often thought of as one of the best places to see street art, and with local artists like Jack Douglas and places like Hosier Lane, it is easy to see why. great pic, I have photos of the same art, taken perhaps a month after you. Oh that is so cool! I always wonder how long some of this art is up for. Sometimes it gets painted over so quickly. When I get married, can you come and be my photographer?? I just love your pictures, and I’m starting to feel like a broken record leaving the same comment on all your posts! !